Should tables be off the table? We’re in an art gallery…… but there are no paintings on the walls. The paintings are just described to us. Also, the person describing them is really quite dull, and is just listing off colours and their locations on the canvas. You don’t get a feel for the mood and you’re not even sure what the painting is of! You’ve wasted your time on a terrible day out! Most of the time, this is how I feel when I see tables of data. When we produce our publications, the temptation can often be to pour all of our data onto the page in a table. This is the quickest way to get the data to the user, right…..? When you produce a table, consider what the data is saying. Presumably it has a story to tell, or you wouldn’t be publishing it? Think back to how we felt in the art gallery! A good picture can paint a thousand words, so let’s really try to SHOW the reader the messages in the data! A recent tweet from data journalist Alberto Cairo perfectly illustrates this point. 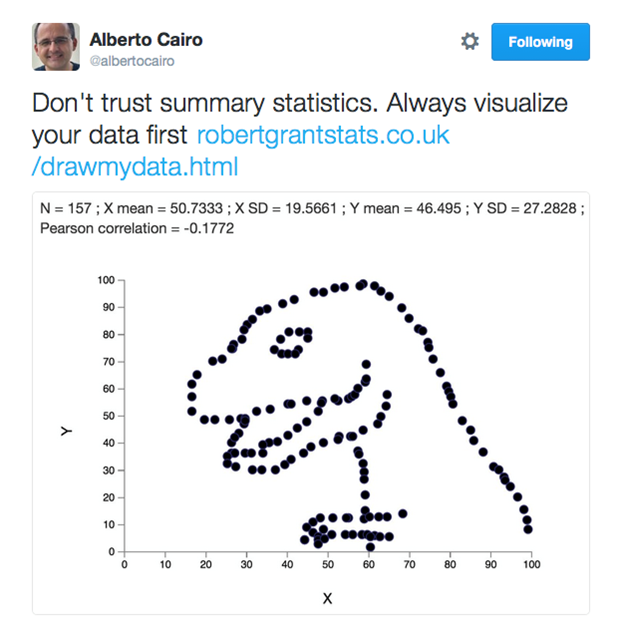 Would you see the Data-saurus by just looking at the summary statistics or observing the data in a table? Almost certainly not! A more classic example of this challenge is illustrated by the Anscombe’s Quartet. Visualising your data isn’t always simple, and there aren’t always right or wrong ways to show a single dataset. It’s all about what you feel the main messages should be. In a previous blog, Rob Fry spoke about how you can pick the best charting strategy for the message in your data. This could help your thinking if you’re wondering how to best get started with presenting a table of statistics. Now let’s apply this thinking to a genuine ONS example. The House Price Statistics for Small Areas (HPSSA) release aims to report house prices by local areas. As data go, these would be reasonably easy to simply publish in a table. The reporting periods are simple and the data can be taken at face value, with no confidence intervals or mitigating methodological quirks. 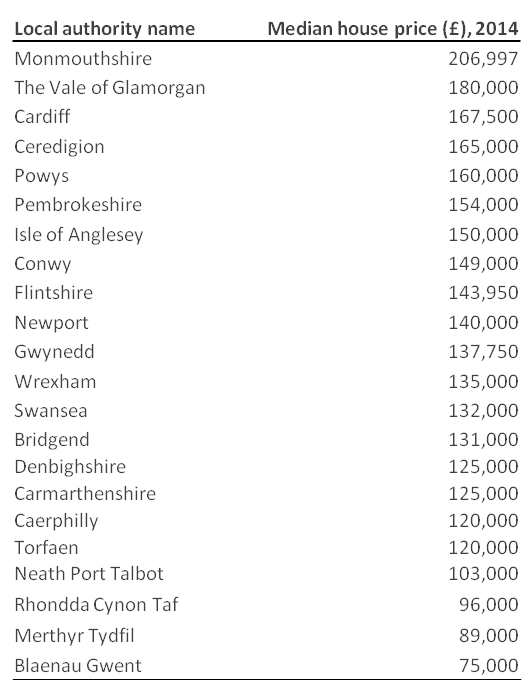 Below is one such table with 2014 house prices by local authorities in Wales. I suppose the table does a reasonable job. It’s ranked by value and fairly easy to explore, but could it do more? Presenting the data in a simple horizontal bar chart addresses a few of the table’s shortcomings. It is easier for a user to really see and compare the magnitude of the values, with any outliers such as the particularly low Blaenau Gwent standing out from the crowd at first glance. I’ve also placed a bar with the Welsh average on the chart. This clearly stands out from the rest, and offers wider context. The reader can make meaningful observations about how areas compare with each other and the overall average without being drowned in figures. Finally, but quite importantly, I’ve given some thought to the title. Rather than a dry statement of its content, we have a question that primes the reader to look for the story we are trying to illustrate! We’ve now produced a simple, clean and insightful chart. This is far more effective at giving the user a feel for the numbers than our original table and we could happily publish in our article, bulletin or even on social media. But like I said, there are no right or wrong answers! I might have decided the most appropriate story to focus on was the disparity between areas of Wales. How does each area compare to the Wales average, what is the difference? This isn’t unreasonable, so we could take a different approach. Take the chart below for example. We’ve just painted the same subject, but from a different angle. Whereas before, our common “horizon” (the baseline from which we read values) was £0, it is now the Welsh average (£140,000). 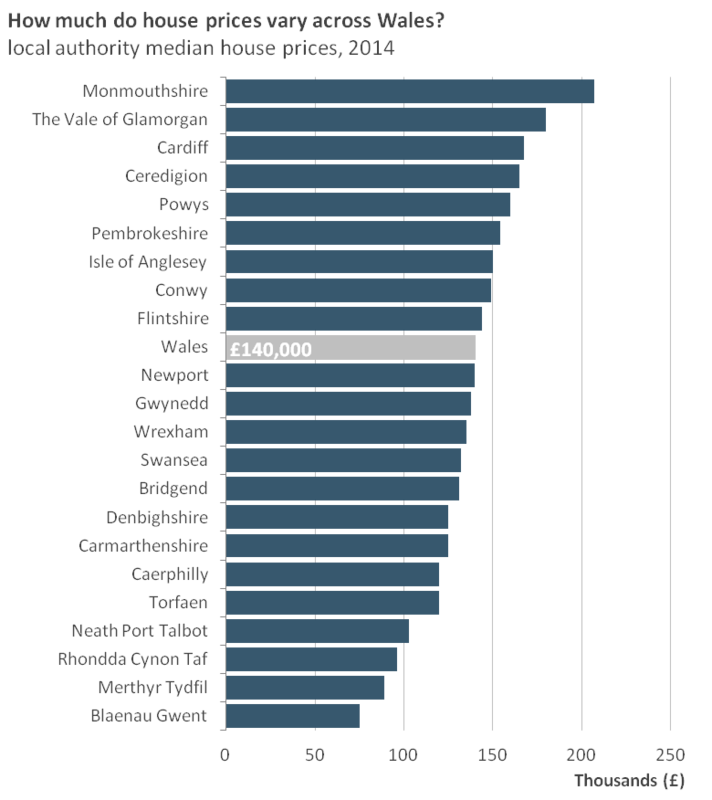 Once again, we’ve produced an insightful chart that describes house price disparity in Wales far more effectively than our table ever could! Lastly, let’s think about another story that the table is pretty hopeless at telling. How do prices vary in the north as opposed to the south? Between rural and urban areas? Tables are terrible at showing geographical patterns in data. 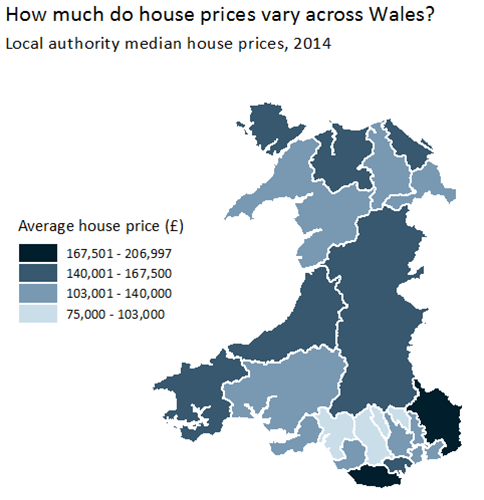 Even if the user knew the exact shape and position of every local authority in Wales, it would take a special kind of genius to form a picture of the country’s house prices perfectly in their head! A good way to show this would be to draw a map. Below I’ve produced a very simple map that broadly describes the spatial distribution of prices in Wales. The user can instantly see how the most expensive areas are in the south and closer to the east (English border). 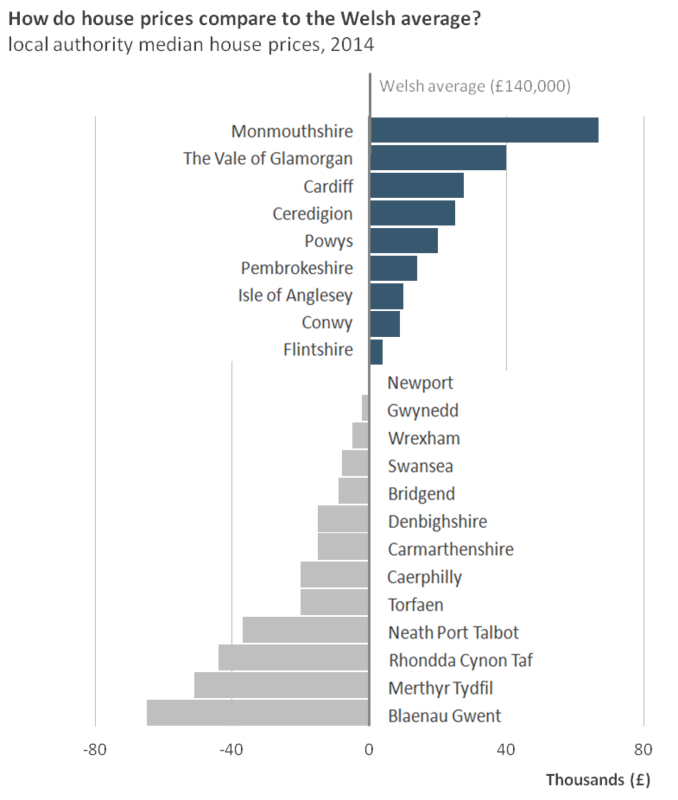 They will also see the cheapest areas very close by in the Welsh Valleys. Isn’t it interesting how all of the action is happening in a relatively small area in the south east of the country? It is not at all easy to see this by looking at our original data table! Even in our very simple table of 22 house price figures, we could go on and on picking stories to visualise in different ways. If you need to produce more than one chart to represent different relationships in your data, go ahead and do it. The possibilities for educating and enlightening your readers should really encourage you to go that extra step when you are about to publish a table. Let’s now imagine we’re in a better art gallery. All of the art is clearly displayed around you, and the paintings are beautifully lit and framed for maximum impact! Why should your data be any different?